Learn how to take your application performance analysis to the next level. Add context and get more detailed results with custom attributes, or by importing additional datasets. This course will show you how to import JSON data to the Insights API endpoint, alongside default data captured natively. Learn how to take your application performance analysis to the next level by enriching existing data. Add important context and get more detailed results with custom attributes, or by importing additional datasets via custom events. This course will show you how to import JSON data to the Insights API endpoint, alongside default data captured natively via New Relic agents, for deeper analysis. Identify and use different types of custom data. Determine what custom data to add. Add custom attributes and events. Access and use the Insights Data Formatter to configure the way your data is displayed. Learn about the types of data captured automatically within Insights and take your analysis to the next level by adding your own business data. Add important context to your existing data with custom attributes or import additional data sets with custom events for more detailed user analytics. 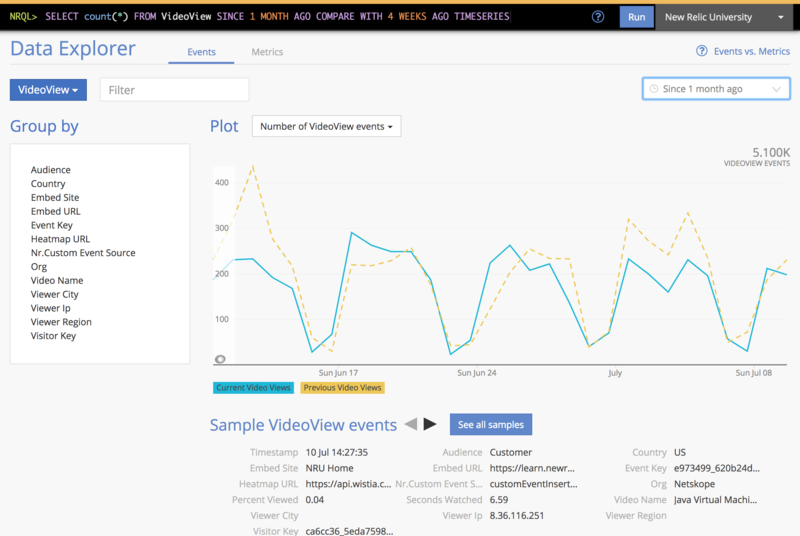 Learn how to import data as JSON to the Insights API endpoint - enrich existing data streams and add important context to your data to make full use of Insights' capabilities and visualizations for analyzing your data in real time. Learn how to use the data formatter to set default formats for attributes with numeric values and customize how data appears in your New Relic Insights dashboards on an account-wide basis.